well you DO know how to drive a thtick, thailor. Dr. D I was waiting for it... I mean I was.... HELL I can't type ANYTHING 'round here without leaving myself open for abuse! Angela- Thanks for the offer, but I've already lost my 500sl because they don't make a friggin' manual box for it... I think I'll keep the rest of the toys to myself. DOH!!! BTW, Simon, how did we get Valerie into THIS conversation????? On second thought, don't answer that. Those who had spoke with Chuck keep us posted with more info. My understanding of the new Beck 904 is that a roller will cost around $50,000. 911 aircooled engines can be used along with 901 & 915 transmissions. He (Chuck) was talking about using brand new Boxster & Boxster S engines and trannies for people who wanted a car with totally new parts, but that is still in the planning stages. He was also talking about having two models, the R model would have a full roll cage and plexi windows, basically a lightweight track car. The S model would have only a roll bar, glass windows and it would be street car. Had a blast at his 70th birthday party last night! How did the Lister headlights work out? By the way, you didn't happen to get any photos of Sterling's Lexus powered 914? By the time I got around to look at it, it was gone. 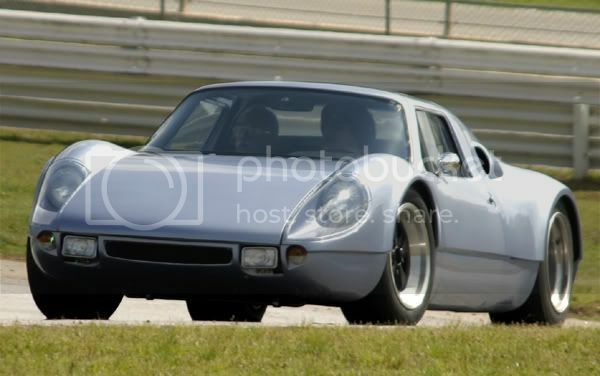 Chuck mentioned that you and Steve were going to get together with Randy and see/drive his 904? Just wondering if that ever happened? The headlights were OK, but not more. Think I'll have to go with some better H4 bulbs. I didn't see Sterling's car, in fact there was so much going on I didn't even get a chance to talk with him. It sounds very interesting!! Chuck's 904 website is live and Jeff from Predator will be updating it as they move forward. For those of you that didn't catch this in Dan's last thread, Chuck has taken the 904 back to GA and is going at it on his own. He (OK, Gleide) is running the website and there are a few videos up on the photos page now. Same link as above. Would you be kind enough to forward the cell # to us? I won;t post it, but anyone can e-mail, call or PM me for it anytime.